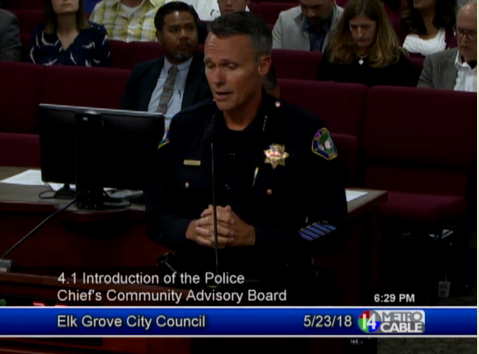 At tonight's Elk Grove City Council meeting, Elk Grove Police Chief Bryan Noblett introduced the community members who were selected for the Police Chief's Advisory Committee. The city's newest committee was formed following several hate incidents last year in the city. Those events led to a series of community meetings where residents expressed a variety of concerns, some of which included how police officer interact with youth, and in general with African-American residents. One of the suggestions to strengthen community relations voiced by several people at each of the meetings was the formation of an advisory committee. Heeding the advice, Noblett initiated the process to form the committee and go through the selection process for the 14 members. While the committee will not have any binding authority, the hope is it will help law endorsement address concerns within the community and act as a sounding board for Noblett. The committee will meet monthly, and the initial session will not be open to the public. The 13 members, all Elk Grove residents, are Dr. Gurpreet Singh, Sharie Wilson, Hillary Gaines, Shirley Lewis, Lynn Wheat, Joy Yip, Stephanie Tseu, Irfan Mehmood, Manny Provedor, Ed Busuttil, Ken Nelson, Todd Bloomstine, and Gerald Williams. The committee is slated for 14 members but one participant had to bow out, so a replacement will be added later. When introducing each of the present members at the city council meeting, Noblett allowed each person to make some brief comments. One of the committee members, Sharie Wilson, owner of the Old Town Elk Grove beauty salon targeted by hate messages that acted as a catalyst for last year's meetings and heightened public awareness, saluted the formation of the committee and Noblett's outreach efforts. "He has made me look at the police department different, so I thank you for that chief," Wilson said. "But I want to be more than just a voice, I want to be part of the solution."